I seriously considered having that previous sentence compose the entirety of this review, as I actually think it does the film, The Demon's Rook, justice in some regard. This is a movie with a lot of ideas and a lot of ambition. Don't get me wrong, I think the Demon's Rook is a terrible film, but I sort of enjoyed watching it. Weird, right? We meet Roscoe, a young boy that is frequently visited by a demon. One night the demon vaporizes Roscoe's parents and brings the child to some sort of alternate dimension known as the Dark Womb. It is here, under the tutelage of this demonic mentor, that Roscoe learns the dark arts and grows into adulthood. Eventually, for reasons I won't disclose here, Roscoe returns to his home world, but three evil demons cross the gateway with him. The demons then go about causing havok- one turns men into beasts, another drives people to commit violent acts, and the last one raises the dead. It certainly doesn't look good for earth. Luckily, Roscoe is able to combat the demons using the dark magic that he was taught by his demonic mentor. Roscoe is even able to "save" one of the men turned into a beast, freeing his mind to take revenge against the demon that disfigured him. He meets up with his childhood friend and potential love interest, Eva. The film builds up to this moment where Roscoe and Eva will face off against the most powerful of the three demons. Roscoe shares his magic with Eva, and it seems that their forces combined might stand a chance at eradicating this evil threat. When the showdown does finally happen. the demon smokes their asses without even a semblance of a fight. Then, out of nowhere, the beast-man whom Roscoe "saved" runs out of the woods and kills the third demon by ripping out its heart. The End. The experience of watching this film is really strange, surreal even. It has all of the makings of a b-movie, including gore and and special effects, but none of it is played for scares. The Demon's Rook is played completely straight, with no winks or nods to the audience. I actually came to watch this movie off of the strength of its trailer - go ahead, watch the trailer on Amazon Prime. The film looks like a fun b-movie romp, with an angry bearded fellow fighting demons - not too dissimilar in tone to something like Jack Brooks: Monster Slayer. 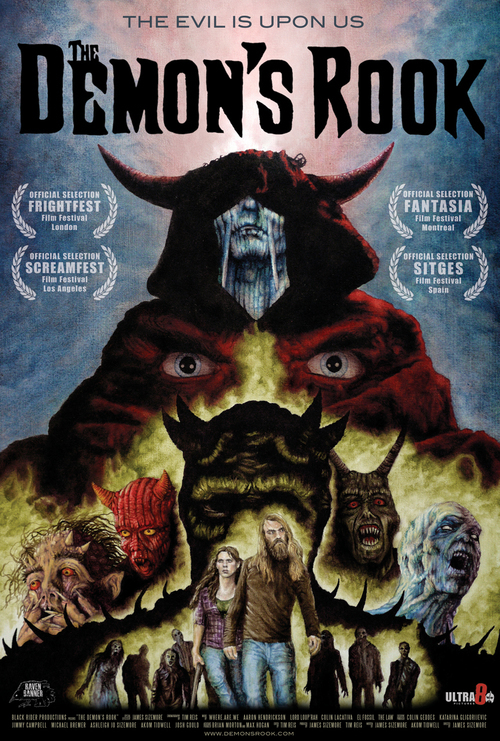 Instead, the Demon's Rook plays out more like a self-serious independent film, or maybe more of an urban fantasy, than a more traditional horror movie. At any rate, I found the film to be a very different movie than the one advertised in the trailer. It has a lot in common with 80's Italian horror cinema, with little dialogue and a constant electronic Goblin-like soundtrack running almost the entire length of the movie. I definitely found this to be a strength of the film. In some ways, I was reminded of the long, lingering cinematography of a Sergio Leone spaghetti western. Two strong comparisons for sure. For a a low budget film, the Demon's Rook is well-made. Story-wise, I understand why this film is called the Demon's Rook: Rook, verb: to swindle or cheat. This film definitely cheats the audience out of a satisfying conclusion with the sudden deaths of both protagonists. I don't know of any other films with this type of campy subject matter that also display this degree of self-seriousness. It's a strange experience from start to finish. I definitely don't recommend the Demon's Rook, but I think I respect it. One out of four Bruces. Ignore the low rating. This film is weird and it might be the right weird for you.